I am trying to be more judicious when choosing a sentiment for my cards so I can fill up my stash evenly. One type of card I am always looking for last minute is a hostess card. But since you haven’t actually enjoyed the hospitality yet, it can be awkward to find the right thing to say! KWIM? I can’t say thanks for the meal before I’ve eaten it right? ha ha!! But I like to give a card and small gift when I arrive… So I figured this would work perfectly. And if I needed it as a regular thank you for our family, that would be great too! I like how the chalkboard technique turned out. I don’t like it when I see it done with just white embossing, no flourishes and no ‘dust’. To me those aspects of the technique are vital to making it look like real chalkboard art. 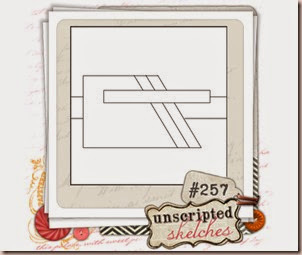 Come on over to the Unscripted Sketches blog and see what everyone has created! This was a tricky sketch for me but you could always straighten those diagonal lines if you like! It’s all about being inspired by the sketch! love your card Rebecca! Perfect chalking and dusting on your card. I don't know how many times I've forgotten to do that part! lol In a hurry to get a photo and get it posted! *sigh* TFS!